Welcome to another edition of DC Mythbusting. This week we’ll tackle the myth that no one is really from DC. The District has a reputation as a transient city, with young go-getters coming here after college, putting in a few years on the Hill, then moving on to bigger and better things. 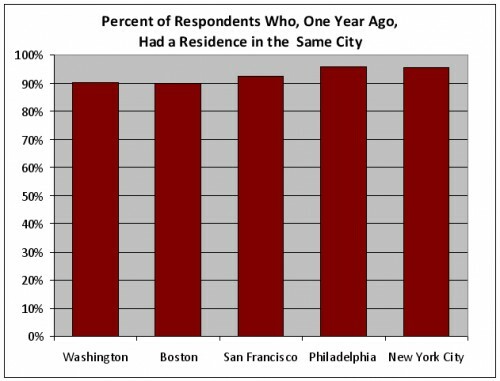 But is DC really more transient than other similar cities? Is no one really from DC? The answer is no, but there’s a bit of a qualifier to that. The best resource to answer this question would be the US Census, which asks a question about where you lived 5 years ago compared to where you live now. But the 2000 Census is seriously outdated (especially since the demographic makeup of the District has changed significantly since then), and the 2010 Census hasn’t started yet. So the next best resource is the annual American Community Survey, which asks two questions that help us answer this question: where was your residence one year ago? and which state were you born in? After the break, see what the American Community Survey tells us about DC. First, the question of where a person lived a year ago. While this is not a perfect measure of how many DC residents are not from here, if the myth is true that no one is really from here, we would expect to see a higher percentage of residents that lived elsewhere last year. But take a look at the graph above: while Washington and Boston are both on the lower side of the selected cities, DC certainly doesn’t look like an outlier. Washington, Boston, and San Francisco were all within three percentage points of one another. So this would mean that a somewhat typical number of DC residents lived here a year ago– not what we’d expect to see if this were a city with a higher-than-average percentage of residents from somewhere else. As a side note, the average national rate of people living in the same house or city/county in the past year is somewhere around 93%, but we can generally expect city residents to move more frequently because of a higher level of renters (rather than homeowners) and younger median populations in general. 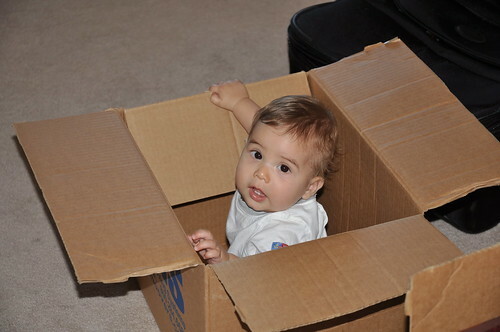 Next, we move on to the question of what state residents were born in. This is a tricky question, because in this sense our city is being compared with other states. If I lived in Boston and was born elsewhere in Massachusetts (perhaps in a suburb of Boston), I would respond affirmatively. But if I lived in DC and was born in a Maryland suburb, I would respond negatively. So we’d expect that the District’s average would be significantly lower than any other city, just because of the way the question is written. But, wow. It’s not. 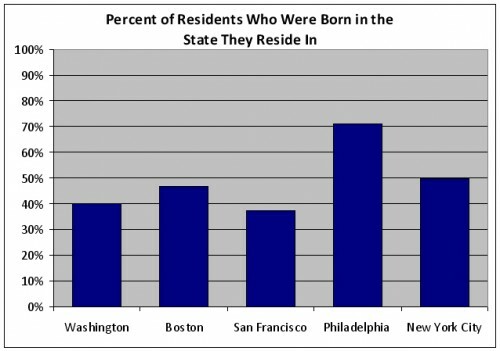 Approximately 40% of DC residents were born in DC, but only 37% of San Francisco residents were born in the State of California. I find that to be a pretty surprising finding. While it’s true that San Francisco and New York City are known as international cities, which would lower the percentage of residents born in that state, the way the question is asked here would mean that DC’s rate should be the lowest of all (especially since we’ve got a pretty strong international presence here too). So this question leads us to believe that a somewhat typical percentage of DC residents were born here. They may not be the people in your social circles, but they’re here. So even though the data is not great for doing this sort of analysis, both of these results show that DC is within the normal range of peer cities. (For the record, I chose Boston and San Francisco because of similar population levels and characteristics as ‘peer cities’, and Philadelphia and New York as other major East Coast cities.) Even though we’ll need to wait until the 2010 Census results to get strong data that confirm or deny that today’s DC residents move more frequently than those in other cities, I think we can safely say that the myth that no one is from DC is clearly false. Forty percent of the District’s residents are from here, and many more (including myself) if you count the surrounding suburbs. Myth BUSTED! Using the available recent demographic data, DC is made up of residents just like any other city, and it doesn’t deserve a reputation for being a transient city that no one comes from. interesting. i never would have figured the born in dc percentage to be that high, and i’m a third-generation washingtonian! i was born in dc, but raised in silver spring – i still say i’m “from” dc, though. i lived in new york too, and am maybe even more surprised that their percentage is even higher. That is the kicker, isn’t it? I’d love to see a decent number of responses to these questions from the readership of We Love DC as opposed to the whole city population. Basically this says to me, poor people don’t move around a lot. So cities, that have a fairly high poverty level, especially African-Americans (hello Philadelphia! ), aren’t going to have at least a base rate of people that are born and bread in one single place. I’d suspect Chicago and Detroit and Pittsburgh are even higher. The transient job hoppers are specific to a larger middle and upper middle group of professional-class workers. I’m from here- so are my brother, sister, mom, etc. We’re all still here. None of them are active on blogs, or are “out and about” as much as the transients, who all seem to run in the same circles. Basically, we already have our friends and social networks. We’re friendly, but we don’t have the same need to go out and make friends as do transplants, who must work hard to start from basically scratch and inevitably meet other transients. It’s just very different circles, for better or worse. And it’s like that everywhere. I’ve lived on and off, in and around DC for most of my adult life and for a short while in San Francisco. I would say that SF has *way* more people not from SF than DC does. Sure, like SF, it’s hard to find someone who graduated from a DC public school, born in the city, etc. But what constitutes a local? Living in 1 spot for more than 12 months does not a local make. FWIW, in Philadelphia, it’s not just the African-Americans who never leave. I know plenty of Asian- and white Americans there who couldn’t be bother to go to college out of state. There’s a neighborhood provincialism there that goes way way, way, back to your great-grandparents living on a block where everyone was from the same town in Palermo. It’s what gives some neighborhoods their charm. I think people see New York as Manhattan – therefore the idea no one is a local – but New York is also Brooklyn, Queens, the Bronx, Staten Island – where plenty of families have been living there for generations. It’s the same with DC, as others have mentioned above, if you think of Congressional staffers, non profit people, interns – DC can be transient. But there’s a whole other culture to DC where people are born and bred. I’m not sure the census data is so irrelevant. The reputation for transience is much older than 10 years. It’d be interesting to look at census data over a series of decades to see if this hold out over a generation. I’d hazard that a lot of native borns/long-term residents left the city during the 60-70s (both black and white) and perhaps there is a sense of a trend toward permanence again. It’d be very interesting to see migration trends in DC and the inner-burbs on an 8 year (election cycle) cycle. I’ve always heard that Dems move into the District and Republicans move into the burbs. I’ll bet that not shown in data, but it’d be a neat question to put to the data. im surprised you didnt look at number of people who live in dc now but are originally from md or virginia or people who live in md and va but work in dc and tell people they live in dc. to me that is what i have always taken the whole “no one is from dc” to mean, that everyone is from md and va.
Based on personal observation, it seems like there are more people from the DC metro region living in San Francisco than people from San Francisco. Washingtonians should try developing a distinctive accent the way they have in Boston, Chicago, New Jersey, etc. That way people will recognize us townies from the get-go, as well as providing a convenient shorthand for local parody (a la Baltimore). How does the census actually take place? I never provided any information in the 2000 census. How do they decide who to contact? I had looked at the 2000 census for DC and something like 20 some odd percent of whites were natives and well over half of African American DC residents were natives. I don’t know a lot of white natives under the age of 45. More over the age of 50 clustered in dowdy neighborhoods west of the park. So it seems to reason that if you are a white 20 something living in Columbia Heights, hanging out with a bunch of other 20 somethings in NoVa and east of Conn Ave, and no having deep personal conversations with your older or ethnically different co-workers, yeah. You’re not going notice a lot of DC natives. And kodak, if you were living in a dorm April 1, 2000? Were you living alone? If you were in a group house one of your roommates might have answered the census on your and other roommates behalf. I did it on my roommate’s behalf. I asked her questions and filled out the form. It’s kind of like traveling. When you’re a traveller, you usually end up meeting way more travellers than locals.